Tritech Business Solutions Limited shall be launching the their Digital Farmer’s platform called Tritech Agric on the 1st of January 2019 by 11am at the company headquarters in Lagos, Nigeria. Tritech Agric is the digital farming platform provided by Tritech Business Solutions Limited to empower cooperators in the food and agribusiness value chain cooperative societies through project funding. Save the date! 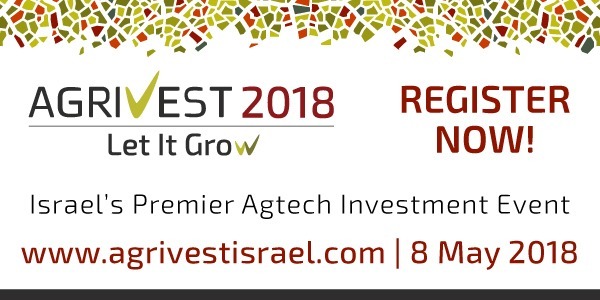 AgriVest will be held on May 8, 2018 at Trask, Tel Aviv Port. Some big investors are looking at Ag’s new opportunities to be had. Just a few months ago, Monsanto bought Climate Corp for a whopping $930 million. More recently, Horizons Ventures, the investment firm of the big-hitting Chinese investor Li Ka Shing, invested in Kaiima, an Israeli biotech company that raised $65 million from investors. Join us in Israel for Agrivest 2013! Join our CEO Rob Leclerc at Agrivest 2013 in Israel! Leclerc will be on a panel ‘Exploring the Key Fundamentals Driving Growth in Agriculture Investment’ along with Ron Meeusen from Cultivian Sandbox Ventures, Gideon Soesman from GreenSoil Investments, and Mitchell Presser from Paine & Partners. When you think of “Israel,” do you think “AgTech”? Probably not, but maybe you should. With two-thirds of its land desert, and one of its two bodies of water called the Dead Sea, Israel has to be creative when it comes to agriculture.